Kwantlen cafeteria food is the product of $7.7-billion food company Sodexo, Coca-Cola earned the rights to be “the sole provider of beverages” on campus and if students want to check out books, they can do so from one of four Coast Capital libraries. 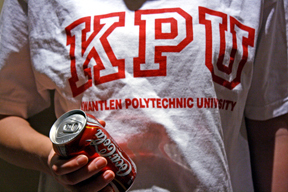 Corporate entities are visible all throughout Kwantlen, but it may not be a bad thing. For example, when “Ahh Giver” Coca-Cola entered into a multi-year agreement with the school, one condition of the contract was that the company would be required to provide annual funding for student and faculty projects and events. Kwantlen also received $1 million from Coast Capital Savings credit union, the largest single donation ever received, according to the school. Last semester, Eva Botten, co-founder of the former Kwantlen club Friends 4 Food, led a campus action day against corporate involvement before the group folded. The club provided healthy meal options for students in an effort to boycott the school’s food and drink corporatization. Despite being against the idea behind privatization, Botten could still see the positive aspects. “Ultimately it is our campus, and if students decide that we want a better library, better this, better that and we can’t raise funds to do it on our own, then sure, bring somebody in,” she said. The fourth-year criminology student claimed the ends don’t always justify the means, and the concept of privatizing aspects of the university can, in the long run, be detrimental to student life. “Almost every single building has its corporate entity to it, and I don’t know when it’s going to stop,” said the club’s former advocate and cook. “I think it means the total enclosure of student grounds. “If we want to become more of a university, I think that [university] space should at least be available for students,” she said, adding that the paperwork process involved in setting up fundraisers or display tables on campus is a major deterrent for clubs such as Friends 4 Food. “It’s completely going to crap,” she joked, adding, more seriously, that she believes no matter what, decisions “should always be in favour of the students”.